Fair enough. I can take a hint. There is actually a bit more to this single than meets the eye. Firstly, Boyzone were still very much an extant band at this point and there was one more single to come before they quietly entered hiatus. Secondly, their hits compilation was in the middle of a nine week (non consecutive – a two followed by a seven) when this single was released and WYSNAA actually featured on that album, despite being a Ronan solo track. 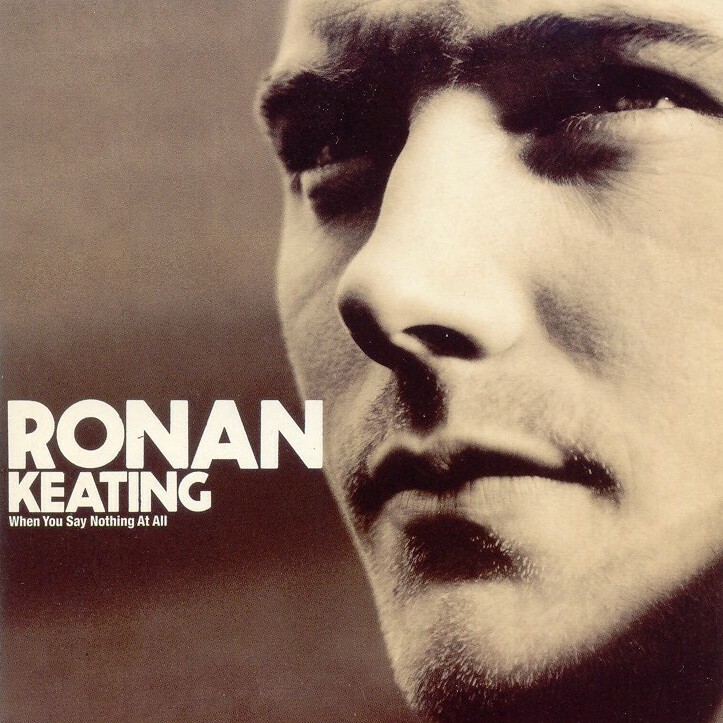 Obviously this was also featured on the soundtrack to the film Notting Hill and this could be seen as a clever marketing ploy to see if Keating was marketable as a solo act – if not the single could be treated as a one off and Boyzone could carry on as before. After this song entered at the top the mid weeks suggested that Ricky Martin would return for a fourth non consecutive week. Curiously Keating recovered to hold on and Martin slipped to third. Mention must go here to the song in second place – Better Off Alone by DJ Jurgen featuring Alice Deejay (often wrongly credited as the performing artist) which began a three week lock down at number two, outselling all three chart toppers concerned. That Stuart White fella needs a shoeing. Dreary song from a film that even now makes me wince. Classic Singing Assembly fare (see Popular comments passim): even a choir of shrieking six-year-olds and sullen mumbling eleven-year-olds is a comfortable match for Ronan, and that combined with the immense teacher value of having the words “you say it best when you say nothing at all” available to point at knowingly meant I remembering performing this a number of jolly times. I can’t really separate this song from Keith Whitley’s death, so I’m never not depressed by it. This was a country #1 in Christmas of 1988 and Whitley died in May 1989 of alcohol poisoning. Age 33. Seem to recall the video for this had to be withdrawn and re-edited due to its excessive promotion for Notting Hill – as well as the clips from the film they also included the line “Watch Notting Hill” on screen. The thing about this song I really hated was one particular moment in the Top of the Pops performance. In those days, Top of the Pops would usually film just one performance of any given single and repeat it whenever required, so if a song stayed in the chart for a bit you’d get to know the performance very well. Hence in this performance I became totally infuriated with a bit right at the end, in the penultimate line, with Ronan’s big “the smile on your face lets me knooooooooow….” note before the last line. As the audience cheered and applauded, Ronan did an unbelievably smug smirk and nod, clearly thinking “Yeah, NAILED it!”. Hated it enough the first time, absolutely infuriated by about the sixth time. Ronan always was the smuggest man in pop. Boyzone are on Children In Need tonight. I’m guessing they’ll be still be there in 20 years. Built to last, I fear. Seeing Tom’s initial review of this made me laugh out loud the other day – I’ve been waiting for one like this. I haven’t yet read the actual review of this and the succeeding single. The tune is familiar to me, probably from the Alison Krauss version. I actually don’t mind the song much, but there’s something about Ronan’s voice/delivery that just seems weird. And learning of the Webster switch knocks off an additional point from me, so 3/10. There was a version of this sung by Irish Singer Frances Black that had been played quite a lot a year or two before this on Irish Radio so was surprised that Ronan jumped on it so soon. At the time wasn’t fussed with this but as I’ve gotten older have to say I love it. The lyrics and tone are great in this track. Don’t get me started on Alison Krauss, whom I adore. I was a country music radio DJ (OK, presenter, maybe) for a number of years, and this song always got requests from listeners. I’m more numb to its many charms for that reason, but Alison Krauss could sell anything. Putting aside her original material in bluegrass and with Robert Plant, if you get a chance, you might want to seek out her choice in covers. To cover Blind Faith takes real balls, but her take on “Can’t Find My Way Home” is haunting. Maybe a touch less successful is the song that accompanied “When You Say Nothing At All” to radio, a cover of the Foundations’ “Baby, Now That I’ve Found You”, but it’s fresher. Notice how I’ve ignored Ronan Keating? Fittingly so.